I love to make our children's Halloween costumes. As a stay at home mom I must always keep our budget in mind and not spend too much. I usually start digging through their closets to see what they have to work with. Now that they are older I get their input when creating the costumes. Here are a few costumes from years past. When our daughter was 6 months old I created a headband to look like a flower. Using a pinking sheers I cut out a fun printed fabric in the shape of petals. Then I hot glued the petals to a plastic headband. I placed the plastic headband over her bonnet so it wasn't pushing in on her head as headbands sometimes do. Last, I placed her in a flower pot. Tada - a blooming flower. 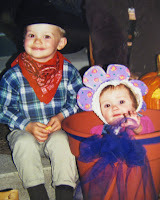 That year our 2 year old son decided he would go as a cowboy. Very easy - he loved his boots and owned lots of plaid flannels. A bandana and black cowboy hat was all we needed to finish off the look. When our son was 3 he wanted to be a pumpkin. I purchased an xxl orange t-shirt and painted a jack-0-lantern face on the front. I then threaded elastic through the hem at the bottom of the t-shirt. Once he put the shirt on we stuffed it with crumpled newspapers. He was able to wear his winter coat underneath the shirt - that was the best thing about this costume. Our daughter was 1 1/2 when she was a flower-girl for her aunt Julie. I designed this dress to match the brides dress and hated to just put it away when the magical day was over. When Halloween approached just 4 weeks later we pulled out the dress. Off to the store to purchase some angel wings and a stop at the craft store. I made a halo out of wire Christmas trim and a white headband to complete the look. With very little work we had an angel. It was great to be able to have our daughter wear this lovely dress again. 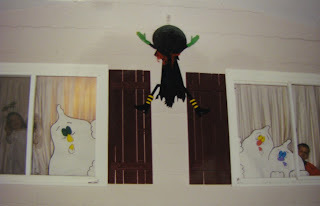 That same year I found a flying witch decoration that I couldn't resist. My husband suspended it from the outside of our home. We had no trees to post it on so he had to get creative with where to hang it. Once the witch was hung I decided to draw some ghosts out of inexpensive white poster board. Those were placed on the inside of our windows. We had many neighbors comment on how fun the decorations were and how they so enjoyed the windows. Hope you are inspired to create something for your Halloween. Come back tomorrow for more from this year's costumes. Trick or Treat.